In our report here on Wednesday 27th March we highlighted a resilient tone for GBPUSD ahead of the indicative Brexit votes that evening. As we arrive today at 29th March, the previous Brexit deadline date, we stand ready for ANOTHER, third vote on Prime Minister Theresa May’s Brexit deal. Although this deal received a boost earlier this week, as both Jacob Rees-Mogg and Boris Johnson have indicated they are willing to vote for her deal (albeit reluctantly), the Northern Ireland, Democratic Unionist Party (DUP) are reluctant to give it their support. At the moment, it appears unlikely that PM May’s vote will pass and this has seen the Pound fall over the past 24 hours. Here we again focus on GBPUSD. A plunge Thursday through supports at 1.3149/41 and to reject the recent resilient consolidation, switching risks lower into Friday. The aggressive, mid-March advance through the late February peak at 1.3350 switched the intermediate-term outlook to bullish. 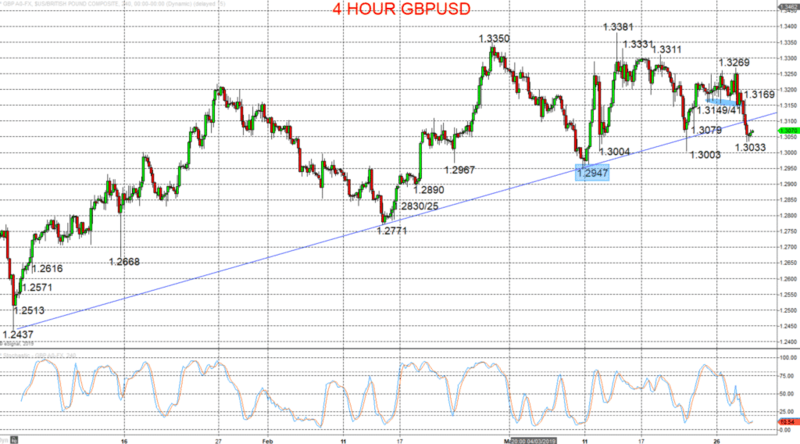 We see a downside bias for 1.3033; break here aims for 1.3004/03, maybe towards key 1.2947. But above 1.3110/12 opens risk up to 1.3169. Intermediate-term Outlook – Upside Risks: We see an upside risk for 1.3473. What Changes This? Below 1.2947 shifts the intermediate-term outlook straight to a bear theme.